FOXWEDGE (AUS) (Bay 2008-Stud 2012). 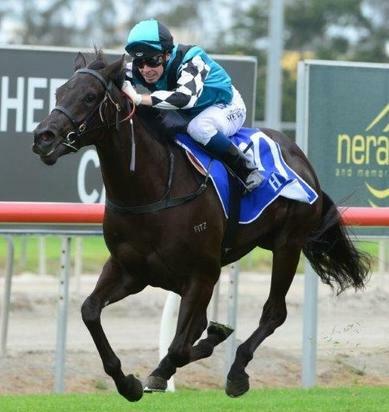 5 wins-2 at 2-to 1200m, MVRC William Reid S., Gr.1. Sire of 255 rnrs, 111 wnrs, inc. SW Foxplay (ATC Queen of the Turf S., Gr.1), Volpe Veloce, Fox Swift, Hertford Dancer, Fox Hall, Kentucky Miss, SP King of Spades, Seafront, Star Empire, Urban Fox, Volpino, Neola, Albumin, Aghna, Petition, Foxtrot Lady, African Rainbow, Ajay Tee and of Pony Power, Battered, Colosimo, Lualiwa, Silence - Eagle (H.K. ), etc. Pony Power (f. by Foxwedge). Winner. See below. FLEET (Dehere). 2 wins-1 at 2-at 1100m, 1400m, A$124,628, VATC Mercedes-Benz S., L, STC Mona 2YO H., 2d VRC Shamrock Travel H., L, 3d STC Pal Consulting Group H., 4th AJC Keith Mackay H., L, VATC Veuve Clicquot S., L, VRC Great Western H., L.
Best Elect. 4 wins to 1400m, TRC Terrace View H., BNI Derwent H., TTC Greg Mansfield H., 2d TRC Thorpe Transport H., Andrew Mason P., TTC Rustia H., 3d TRC Kingston Carpet Choice H., Xerox Printer P., TTC Life Members H.
Di Canio. 3 wins at 1600m, MVRC Tatt's H., 3d MRC But Beautiful H. Producer. Joie More. 3 wins-1 at 2-to 1200m, A$80,350, MRC Courtza H., MVRC Cbus Super H., 2d MRC Mark Pejic Classic, 3d MRC Glasshouse Cafe H., Orrong H., 4th MRC Twilight Glow S., L. Producer. SECRET AGENDA (Not a Single Doubt). 6 wins-1 at 2-to 1200m, A$1,295,900, to 2016-17, SAJC Ubet Classic, Gr.1, ATC Sapphire S., Gr.2, MRC How Now S., Gr.3, VRC Gucci S., Gr.3, MVRC CRT Whites Wires 2YO P., MRC Grand Hotel Frankston H., 2d ATC Sapphire S., Gr.2, MRC Thoroughbred Club S., Gr.3, MVRC Typhoon Tracy S., Gr.3, Champagne S., Gr.3, 4th SAJC Goodwood S., Gr.1, Euclase S., Gr.2. Sweetener (Snitzel). Winner at 1000m, 3d MRC Blue Diamond Prelude (f), Gr.3, SAJC Hyland Race Colours H.
EUPHORIA (Marauding). 3 wins. See above. CHRISTMAS TREE (Biscay). 6 wins-3 at 2-to 1200m, A$214,740, STC Pago Pago S., Gr.2, NSW Tatt's RC Roman Consul S., Gr.3, MVRC Red Anchor S., L, AJC Sunnyside H., Masterton Kindergarten S., STC Stampede Flying H., 2d AJC Up & Coming S., Gr.3, VRC Rupert Steele S., Gr.3, 4th STC Golden Slipper S., Gr.1. Sire. STERLING CITY (Nadeem). Champion Older Sprinter in UAE in 2013-14. 8 wins to 1400m, A$4,000, S$20,000, HK$10,795,750, 4,404,000Dhs in HK and U.A.E, Meydan Dubai Golden Shaheen, Gr.1, HKJC Premier Bowl H., L, Chinese Club Challenge Cup, L, Premier Cup, L, BMW Performance Race H., Aquamoist H., University Hall H., Friendship Bridge H., 2d HKJC BOCHK Wealth Management Jockey Club Sprint, Gr.2, Elite Youth Football Camp H., News Bar Talk H., Chevalier Seniors Housing H., 3d HKJC Chairman's Sprint Prize, L, Sapphire H.
TELPERION (Street Cry). Winner at 2, A$482,100, ATC Lonhro P., L, 2d ATC Sires' Produce S, Gr.1, 4th ATC Golden Slipper S., Gr.1, Skyline S., Gr.2. CUMBRIA (Lake Coniston). 6 wins to 1450m, A$142,880, SAJC Christmas H., Gr.3, QTC Beau Zephyr H., Whetu H., SAJC Urgent Request H., 2d Balaklava Cup, L, BTC Glenlogan Park 2YO S.
THE JUSTICE LEAGUE (I Am Invincible). 4 wins-1 at 2-at 1200m, 1400m, NZ$156,425, to 2016-17, Wellington Guineas, Gr.2, Whangarei RC Northland Breeders's S., L, ARC New Zealand Herald H., 2d Matamata RC Rich Hill Stud H., 3d Rotorua RC Mills Reef Winery & Restaurant H.
All in Fun (Pillaster). 6 wins from 1000m to 1600m, AJC Bert Lillye H., STC Truscott's Toyota H., 2d AJC National Trust Directors Welter H., STC Stockland Merrylands H., 3d STC Frank Underwood Cup, L, AJC 3YO H.
FOREHAND (Bellotto). 9 wins from 1200m to 2200m, A$199,250, Kalgoorlie Gold Cup, L, Kalgoorlie Boulder RC Boulder Cup, L, BATC Centrepoint Funding Open H., Riverwood Cartons H., 2d QTC Exhibition H., L.
Stand and Cheer (Kenmare). 6 wins from 1400m to 2400m, A$85,560, AJC Crossing H., Holsworthy H., WATC Galilee H., 3d City Tattersall's Club Cup, L.
ELLIOTTO (Easy Rocking). 9 wins-1 at 2-to 1500m, A$466,625, WATC RJ Peters S., Gr.3, Westspeed 3YO H., 2d WATC Asian Beau S., Gr.3, Carbine Club of WA S., L, 3d WATC AJ Scahill S., Gr.3-twice, Goodwood Sprint H., L.
KENCONCARNE (Kenmare). 10 wins from 1100m to 1600m, A$321,600, BTC Doomben S., L, QTC Ascot H., L, Marco Polo H., L, 3d BTC Summer S., Gr.3. READY TO RIP (More Than Ready). 8 wins to 1200m, A$604,960, MRC Bletchingly S., Gr.3, Thoroughbred Club Cup, L, VRC Sprinters Final H., L, 2d MVRC AJ Moir S., Gr.2, 3d MRC Caulfield Sprint H., Gr.2, PB Lawrence S., Gr.2. STRYKER (Fastnet Rock). 2 wins at 1200m, 1350m, A$373,325, BRC BTC Classic, Gr.3, STC Heritage S., L, 3d AJC Galaxy H., Gr.1, STC Golden Rose S., Gr.1, AJC Challenge S., Gr.2, STC Pago Pago S., Gr.2. Sire. BUCKINGHAMPSHIRE (Lonhro). 2 wins-1 at 2-at 1000m, R238,975, Kenilworth Summer Juvenile S., L, 2d Kenilworth Racing It's a Rush S.
PRESENTING (Redoute's Choice). 5 wins-1 at 2-from 1200m to 2050m, A$142,850, SAJC Morphettville Guineas, L, MRC Black Onyx 2YO H., MVRC Oaklands Hunt Cup H., VRC KA Morrison H., SAJC Perks Property Investments H. Producer. Doctor's Orders (Alzao). 8 wins-1 at 2-from 1000m to 3200m, A$139,505, AJC Pure Fire H., WATC Healthy Choice Quality H., 2d WATC Tattersall's Cup, L, 3d STC WJ McKell Cup, L.
CASK (Fort Wood). 3 wins from 1450m to 1800m, R529,845, Kenilworth Premier Trophy, Gr.2, 2d Kenilworth Premier Trophy, Gr.2, Enjoy Cape Racing H., What a Winter P., International-Racing SA/WPOTA H., 3d Greyville Thukela H., L, Durbanville Kuda Personal & Commercial P., Kenilworth Enjoy Cape Racing S., 4th Clairwood Cup Trial, Gr.3, Fairview Algoa Cup, Gr.3. BENTLEY BISCUIT (Peintre Celebre). Third on the 2006-07 Australasian 4YO+ Classification (sprint). 12 wins from 1100m to 1600m, A$1,446,725, BTC Cup, Gr.1, AJC TJ Smith S., Gr.1, All-Aged S., Gr.1, Shorts H., Gr.3, Avenium H., STC Winning Edge Presentations Welter H., Nick Robin Memorial H., Young Members Raceday H., De Bortoli Sacred Hill P., De Bortoli Wines H., IEU Your Rights at Work Cup H., 2d Newcastle JC Newmarket H., Gr.3, 3d AJC Doncaster H., Gr.1, 4th AJC Galaxy H., Gr.1. LANDLOCKED (Zabeel). 10 wins from 1200m to 2000m, A$320,300, Murrumbidgee TC Wagga Wagga Gold Cup, L, AJC Beau Zam H., SCTC Summerveld Racing Stables H., STC Members H.
GOLD ALLOY (Testa Rossa). 6 wins from 1350m to 1700m in Macau, Macau Guineas, L, Macau Golden Group Charity Trophy H., 2d Macau Derby, L, Macau Sand Specialist S., L.
RAIN DRUM (Fastnet Rock). 6 wins from 1500m to 2000m, A$338,510, ATC Shannon S., Gr.2, Wilson Asset Management H., Bowermans Office Furniture H., Cox Plate Day at Rosehill Gardens H., Mercure Kooindah Resort H., 2d MRC Eclipse S., Gr.3, ATC Gow Gates Insurance H., 3d Murrumbidgee TC Wagga Wagga Cup, L, 4th MVRC Schweppes Crystal Mile, Gr.2, VRC Visit Victoria P., L.
SNITZEL SPIRIT (Snitzel). 6 wins from 1200m to 1800m, S$364,172, Singapore TC Causeway Classic S., L, Progressive S., 2d Singapore TC World Airlines S., 3d Singapore TC More Magic 3YO Championship, L.
THORN PARK (Spinning World). 9 wins-2 at 2-to 1500m, A$1,535,725, QTC Stradbroke H., Gr.1, BTC Cup, Gr.2, AJC Hobartville S., Gr.2, STC Phar Lap S., Gr.2, Premiere S., Gr.2, MRC Moonga S., Gr.3, STC Member for a Day H., Club Seven Hills 2YO H., Medina Serviced Apartments 2YO H., 2d AJC Up & Coming S., Gr.2, Expressway S., Gr.2, 3d VRC Australian Guineas, Gr.1, Emirates Classic S., Gr.2, 4th BTC Doomben Ten Thousand S., Gr.1. Champion sire. Race Record: 1 Starts 1-0-0 A$40,200. Winner at 2 in 2017-18, GCTC Vilis Family Bakery 2YO P.